Say you are working on a project in a county coordinate system, but you only have access to an aerial image in UTM. You will need a method for reprojecting that image to the county coordinate system so that it lines up with the rest of your project data. Map Task Pane can do that for you. The first step in the process is to be sure your drawing has the project coordinate system set in the drawing settings. Next, type MAPWSPACE into the command line and choose the default option ON to turn the task pane on. Next, click on the Data button and choose Connect to Data. 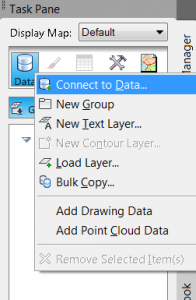 Once the Data Connect dialog box opens, click on Add Raster Image or Surface Connection from the menu of Data Connections. Next, click on the image button on the right side to browse to the image source file, and then click Connect. 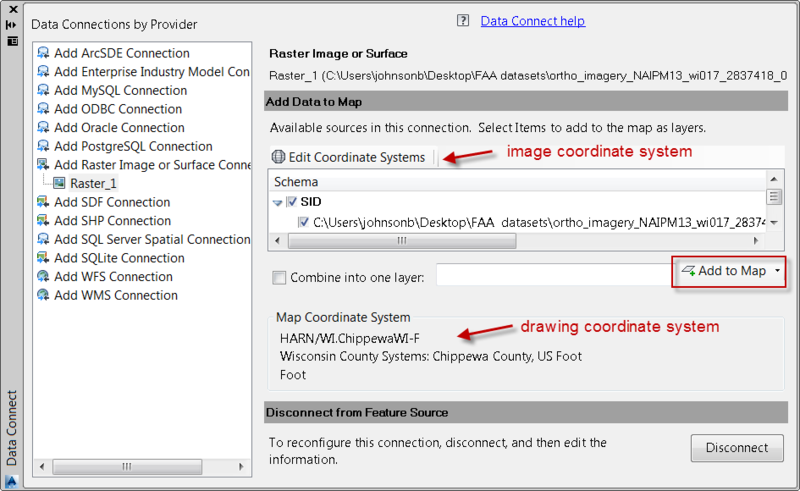 In the next section of the dialog notice the Map Coordinate System section. This is the area showing the coordinate system which is set for the drawing. This next part is important. The Edit Coordinate System button is where the user can confirm the coordinate system for the image. Click on this button. If the Coordinate System is listed as < unknown > the user will need to set it manually by clicking the Edit button and selecting the proper coordinate system from the list. If you are not sure what it is, you will need to consult the image metadata. If this is not defined properly, the reprojection will not work. Once that has been defined, click on the Add to Map button, and the aerial should be placed in the drawing at the proper reprojection.